Don’t forget what you planted ever again; you can make your very own plant markers in no time. 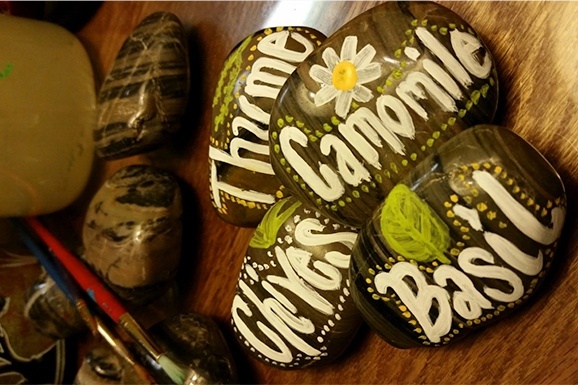 All you’ll need are some rocks (size up your space before choosing your rocks, you may want them to be palm sized or smaller for containers), acrylic paint of your choice in color, a fine point paintbrush and a clear coat sealer. Decide which way the rock lays the best, then paint the top side with the name of your plant. Keep them simple with just the name or add in some extra flare to catch the eye. You may need several coats, be sure to let each coat dry before reapplying. Once you’ve got your rocks named, spray them all with the clear coat sealer to keep them as fresh as the day you painted them. Happy rock painting!